This. This was a romantic novel in a glass. So many pages. So many twists and turns. It was as if M Night Shyamalan was writing in a leather bound book just for my peering, unadulterated eyes. There was even a chapter that had my head jammed in a burlap sack, thrown into the back of what felt like, an old weathered, Volkswagen van, with shag carpeting everywhere. My senses were being overthrown with such power. Sheer, intense, power. It was like the battle of helms deep was shrunk and shoved in my un-expecting palate, and Gandalf riding in on Shadowfax with his staff held high, shooting magic everywhere with a wizardly glare! "Jeepers!" I exclaim! as I gingerly lift the shimmering chalice of Wild Sage towards the heavens! The sun, caresses the condensation that hugs the glass. Golden drops cascade, and reside into the bottom of the glass. Bliss. Bringing the holy cup back down, I motion it so, towards my nose. Yes. YES! Sage! Lemongrass! Even lilac makes a brief appearance! They Immediately rush into my nostrils, like Victoria Falls in Zimbabwe. It is delightfully overbearing, and my senses give a warm welcome with open arms. My mind now in a trance. Stumbling backwards, dazed, lost. Where am I? Who am I? The only thing that I can remember is this beer. I press on wards to tasting it. Oh my (Said like George Takei from the original Star Trek). All my memories pour back into my mind, like the chain smoking, bowling lane, bartender women, pouring pitcher after pitcher of bud light into the gullets of a thousand thirst quenching dads who are only trying to escape the disappointment and shame of the lives they had planted and grown. I now remember who I am, and where I have traveled to. Although I remember my past, this beer startles me, and confuses my taste buds. Right away a clan of shaman, whip me relentlessly with bundles of sage. The fragrance soaks into my pores. Citrus soon follows, and the tartness has me begging for more. Down. DOWN I GO! It tastes like a platoon of men from the army reserve stuff socks with lemons, and initiate me into becoming one of their own. Consistently they slam the sour fruits into my innocent, tender body. Then out of nowhere, my body explodes, and fear strikes the community. Windows are blown out for miles around. Is this the end? Has Russia finally snapped, and attacked our humble tribe? No. They have not. It is just me taking my final form. I have now grown into a beautiful, sleek, shimmering creation of God's final Will and Testament. And that ladies and gentlemen, is what this beer has done to me. 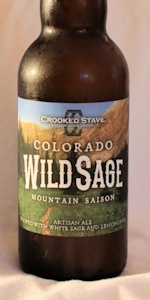 July 8th, 2015 - I'm already glowing with enthusiasm after my first Crooked Stave beer, but the Wild Sage has caught my eye for its curious but promising flavor. Gold with a light chill haze in the glass, it's the aroma that strikes that first botanical note with heavy sage and cinnamon. There's also a bit of toasted cumin, with an all-around smell of Fall. A puff of lemongrass adds freshness that is more citric than botanical. The appealing intensity of the sage on the smell has been pared back for the palate, offering a balanced, mild and brilliantly designed beer. There's a mild sweet glow in the mid-taste, with a longer aftertaste like fresh rain in the desert, preceded by a well paced tour de force of sage's beautiful flavor and smell. A – Light amber and very clear. Frothy white head with moderately long retention. S – Definitely highlighted with fresh sage, that is the first thing that hits the nose. Light Brett funk follows closely behind, then Chardonnay, wine-like grapes, along with hints of peach. T – Fruit, Chardonnay and Pinot Grigio type flavors, followed by barnyard funk. Sage is lighter here, staying mostly in the aroma, but providing mild herbal flavor. M – High carbonation and very dry. Moderate to full body. Moderate sweetness but very well-balanced by the dryness throughout. Drinks very similar to a carbonated version of a Pinot Grigio. O – This is a very good base beer, with the Brett coming in at such a great level, and the sage adding something to take it over the top. Outstanding. Taste like a desert in your glass. Great sage notes hiding with the lemon grass. Lots of brett fubk to keep it interesteting! Super refreshing! Had it at Blue Hill Stone Barns! L: Hazy translucent gold with a ton of floaties. A small white head, good retention, with streaky/spotty lacing. S: Sour lemon candy, orange peel, saltwater, grass, cracker. T: Lemongrass, lemon peel, and lemon candy upfront. Some orange rind bitterness, with a clean cracker malt backbone. Some light funk from the Brett. Just faintly sour. A dry finish of hay, white pepper, clove, and grass. F: Medium and well carbonated. Crisp, clean, and moderately dry. O: A really pleasant, well balanced saison with some unique twists. Smell is lemongrass, mint, Belgian yeast, citrus, and some general funkiness. Taste is sour lemon, pineapple, lemongrass, with a bit of spiciness and a crisp finish. Another awesome beer from Crooked Stave - really accessible Brett beer that is very drinkable and makes it hard to believe this beer is over 7%.